Associate Professor in the Department of Medicine at the University of Manitoba in Winnipeg, Member of the Professional Advisory Council for the Canadian Celiac Association. Assistant Professor in the Department of Medicine at McMaster University in Hamilton, Ont. Registered dietitian in Toronto, Ont, Member of the Professional Advisory Council for the Canadian Celiac Association. Registered dietitian in Victoria, BC, Member of the Professional Advisory Council for the Canadian Celiac Association. Registered dietitian in Regina, Sask, Member of the Professional Advisory Council for the Canadian Celiac Association. Family physician in Charlottetown, PEI, Member of the Professional Advisory Council for the Canadian Celiac Association. Registered dietitian in St John’s, NL, Member of the Professional Advisory Council for the Canadian Celiac Association. Associate Professor of Pediatrics in the Department of Pediatrics at the University of Alberta in Edmonton, Member of the Professional Advisory Council for the Canadian Celiac Association. Professor in the Department of Medicine at McMaster University, Member of the Professional Advisory Council for the Canadian Celiac Association. Professor in the Department of Pediatrics in the University of Calgary in Alberta, Member of the Professional Advisory Council for the Canadian Celiac Association. Professor of Pediatrics and Medicine in the Division of Gastroenterology and Nutrition in the Department of Pediatrics at Dalhousie University in Halifax, NS, Member of the Professional Advisory Council for the Canadian Celiac Association. Objective To describe clinical issues related to bone health in patients with celiac disease (CD) and to provide guidance on monitoring bone health in these patients. Sources of information A PubMed search was conducted to review literature relevant to CD and bone health, including guidelines published by professional gastroenterological organizations. Main message Bone health can be negatively affected in both adults and children with CD owing to the inflammatory process and malabsorption of calcium and vitamin D. Most adults with symptomatic CD at diagnosis have low bone mass. Bone mineral density should be tested at diagnosis and at follow-up, especially in adult patients. Vitamin D levels should be measured at diagnosis and annually until they are normal. In addition to a strict gluten-free diet, supplementation with calcium and vitamin D should be provided and weight-bearing exercises encouraged. Conclusion Bone health can be adversely affected in patients with CD. These patients require adequate calcium and vitamin D supplementation, as well as monitoring of vitamin D levels and bone mineral density with regular follow-up to help prevent osteoporosis and fractures. A previously healthy 39-year-old woman presented with chronic diarrhea, bloating, fatigue, and weight loss of 3 kg. Physical examination findings were unremarkable. Investigations revealed iron deficiency anemia. Her immunoglobulin A tissue transglutaminase (tTG) antibody level was elevated at greater than 250 U/mL (normal level is < 15 U/mL). Her serum calcium level was normal and her vitamin D level was 16.4 nmol/L (normal level is ≥ 50 nmol/L). She was referred to a gastroenterologist and intestinal biopsy results revealed total villous atrophy confirming celiac disease (CD). Her bone mineral density (BMD) was reduced, with a T-score of −2.9 SD. She was started on calcium (1000 mg) and vitamin D (2000 IU) supplements daily. A dietitian provided instructions for a strict gluten-free diet (GFD) and calcium-rich foods. At the 6-month follow-up, she was adherent to the diet and her symptoms had resolved. At the 1-year follow-up, she was well with negative tTG antibody and normal vitamin D levels. She was advised to return after a year for follow-up and BMD testing. Celiac disease is a chronic disorder in which gluten (a protein found in wheat, rye, and barley) damages the small intestinal mucosa by an autoimmune mechanism in genetically susceptible individuals.1 It affects about 1% of the population. While some patients have a clinical picture of malabsorption dominated by diarrhea and weight loss (classical CD), others present with extraintestinal features including osteoporosis and consequently increased risk of fractures.2 The diagnosis of CD is based on well established criteria of positive serologic test results and abnormal small intestinal histology results.3 Dermatitis herpetiformis, “CD of the skin,” is characterized as a chronic itchy rash and most cases display villous atrophy, similar to CD. 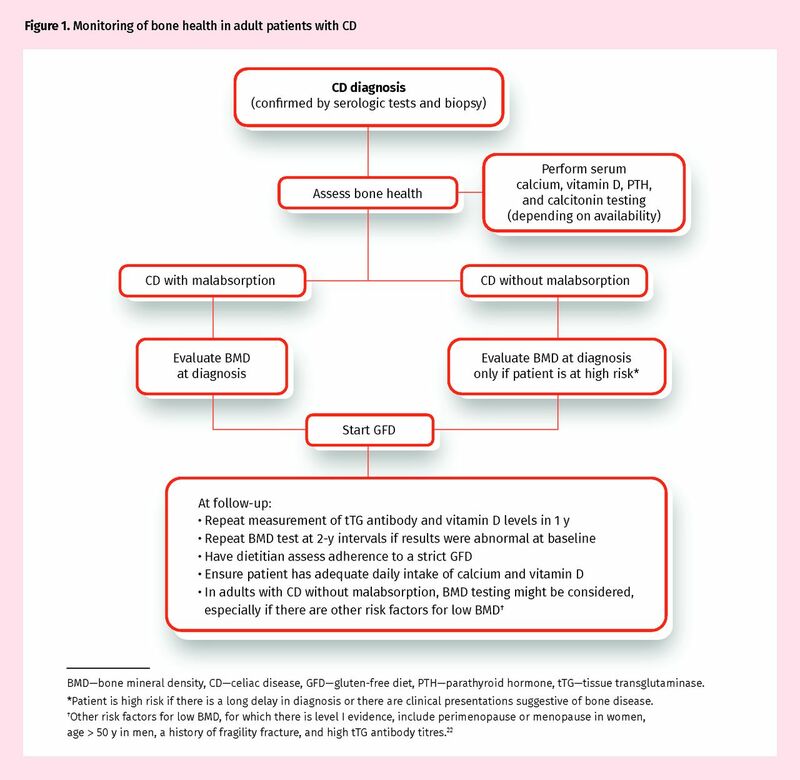 The treatment of CD is a strict lifelong adherence to a GFD. Patients require regular follow-up to assess dietary compliance and monitoring for nutritional complications including bone disease and development of other autoimmune disorders such as thyroiditis and type 1 diabetes. A survey of Canadian gastroenterologists revealed that about a quarter of them do not provide long-term follow-up care routinely to patients with CD after diagnosis and most (86%) expect this to be done by the patient’s primary care physician.4 Therefore, family physicians have an important role in long-term monitoring of these patients including assessing their bone health. A PubMed search was conducted (up to March 2017) to review literature relevant to CD and bone problems including guidelines by professional gastroenterological organizations. Search terms included celiac disease, osteopenia, osteoporosis, fracture, bone mineral density, and treatment. Information regarding recommendations for calcium and vitamin D intake is from Health Canada and the US Department of Agriculture. Bone health in adults with CD. Recommendations for BMD testing and treatment in adults. Based on the above evidence, the Canadian statement for bone health in CD recommends that adults with malabsorption have their BMD tested at diagnosis.22 Correction of malabsorption of calcium, phosphate, and vitamin D should be ensured.22–27 At the time of diagnosis, counseling needs to be provided by a dietitian with expertise in GFDs and in the nutrition required to restore bone health. The recommended daily intake of calcium and vitamin D are listed in Tables 1 and 2,28 respectively. Intake of these nutrients should be optimized using dietary sources, particularly dairy products, whenever possible (Tables 3 and 4).28,29 Also, to help improve bone density and strength, patients should be encouraged to participate in weight-bearing exercises, limit alcohol intake, and avoid cigarette smoking. Patients without malabsorption but who are at high risk of bone disease should also have BMD testing done at diagnosis.22 The risk factors for osteoporosis include perimenopause or menopause in women, age older than 50 years in men, smoking, low body mass index, history of fragility fracture, and high tTG antibody titres. In those with osteoporosis or osteopenia at diagnosis or those who do not adhere to a GFD, it is recommended that BMD testing be repeated after 1 to 2 years following this diet with calcium or vitamin D supplementation. Adherence to a GFD ranges between 42% and 91%.30 Adherence to a GFD should be routinely assessed, preferably by a dietitian with expertise in this diet. If the results of BMD testing are normal at diagnosis, follow-up BMD testing might be considered 2 to 3 years after starting a GFD.22 Figure 122 summarizes these recommendations. BMD—bone mineral density, CD—celiac disease, GFD—gluten-free diet, PTH—parathyroid hormone, tTG—tissue transglutaminase. *Patient is high risk if there is a long delay in diagnosis or there are clinical presentations suggestive of bone disease. Bone health in children with CD. In contrast to adults, children acquire their bone mass during growth. Canadian data demonstrates that the maximal time for bone accrual is the 4 years that surround peak linear growth.31 Therefore, optimal growth is a key factor for maximal bone accrual. Adolescents with CD will be at greater risk given this is the peak time for bone accrual.31 For this reason, early diagnosis of CD likely prevents long-term bone health concerns. Many Canadian children receive insufficient calcium and vitamin D owing to diets deficient in dairy products and inadequate sun exposure. At the time of CD diagnosis, it is recommended that the vitamin D level is measured and supplementation is provided if needed. Counseling about adequate dietary calcium and vitamin D intake (Tables 1 and 2)28 and weight-bearing exercises should be provided. Children and adolescents who do not comply with a strict GFD for 1 year should undergo BMD testing. Recommendations for optimizing bone health in CD. The evidence for management of low BMD and prevention of fractures in CD is limited. Strict adherence to a GFD seems to be the only effective treatment to improve BMD in adults and normalize BMD in children.22 This will decrease the risk of fractures. While there is no consensus on whether calcium and vitamin D supplementation should be prescribed to all patients with CD, it is prudent to ensure adequate calcium and vitamin D intake for all. The role of antiresorptive medications in reducing the risk of fractures in patients with CD also remains unclear. In the absence of strong evidence related specifically to CD, it is recommended that the guidelines from the Canadian Association of Gastroenterology, the American Gastroenterological Association, the Endocrine Society, the Scientific Advisory Council of Osteoporosis Canada, and other dietetic organizations be followed.22,34–38 Similarly, the use of hormone replacement therapy in perimenopausal women should be considered on a case-by-case basis, balancing potential benefits with risks. If after 1 to 2 years of adhering to a GFD and including appropriate calcium and vitamin D supplementation the patient continues to show signs of osteoporosis, the addition of specific osteoactive treatments such as bisphosphonates or teriparatide should be considered.4 The evidence for these recommendations in CD is limited and appropriate studies are needed to address this issue. Our patient had classical CD with diarrhea and iron deficiency anemia. Because she presented with malabsorption, BMD testing was done at baseline and results were abnormal. She responded well to a GFD and took calcium and vitamin D supplements. Her tTG antibody levels dropped to within the normal range. Given her low BMD at diagnosis, it would be reasonable to repeat testing in another 2 years to ensure that it has normalized. If this patient had had no added risk factors for osteoporosis and her presentation did not suggest severe malabsorption, BMD at diagnosis would not have been required. Many patients with CD will improve their BMD in the first year following a GFD. Bone health can be adversely affected in both adults and children with CD. Bone mineral density testing at diagnosis should be considered, especially in adult patients. In addition to a strict GFD, adequate supplementation with calcium and vitamin D should be provided. The addition of specific osteoactive treatments such as bisphosphonates or teriparatide should be reserved for those with persistent osteoporosis despite adequate long-term calcium and vitamin D supplementation. Regular follow-up is important to monitor the bone health of patients with CD. ▸ Celiac disease (CD) is a chronic disorder that affects bone structure. It requires strict lifelong adherence to a gluten-free diet (GFD), and long-term monitoring of patients with CD should include assessment of bone health. ▸ Bone health assessment in CD with malabsorption requires bone mineral density (BMD) testing at diagnosis. Correction of malabsorption of calcium, phosphate, and vitamin D should be ensured. At the time of diagnosis, patients should receive counseling on a GFD and on the nutrition required to restore bone health. Intake of calcium and vitamin D should be optimized using dietary sources, whenever possible. Patients should be encouraged to participate in weight-bearing exercises, limit alcohol intake, and avoid cigarette smoking. ▸ Evidence for management of low BMD and prevention of fractures in CD is limited. Strict adherence to a GFD seems to be the only effective treatment to improve BMD in adults with CD and decrease the risk of fractures. La traduction en français de cet article se trouve à www.cfp.ca dans la table des matières du numéro de juin 2018 à la page e265.
. The Oslo definitions for coeliac disease and related terms. Gut 2013;62(1):43-52. Epub 2012 Feb 16.
. Extraintestinal manifestations of celiac disease. Dig Dis 2015;33(2):147-54. Epub 2015 Apr 22.
. Diagnosis and management of adult coeliac disease: guidelines from the British Society of Gastroenterology. Gut 2014;63(8):1210-28. Epub 2014 Jun 10.
. Long-term management of patients with celiac disease: current practices of gastroenterologists in Canada. Can J Gastroenterol 2010;24(8):499-509.
. Bone and celiac disease. Curr Osteoporos Rep 2016;14(2):43-8.
. Bones in coeliac disease: diagnosis and treatment. Best Pract Res Clin Gastroenterol 2005;19(3):453-65.
. Bone in celiac disease. Osteoporos Int 2008;19(12):1705-16. Epub 2008 Apr 17.
. Bone mass and mineral metabolism alterations in adult celiac disease: pathophysiology and clinical approach. Nutrients 2013;5(11):4786-99.
. Bones of contention: bone mineral density recovery in celiac disease—a systematic review. Nutrients 2015;7(5):3347-69.
. Bone mineralization in celiac disease. Gastroenterol Res Pract 2012;2012:198025. Epub 2012 Apr 18.
. Bone mineral affection in asymptomatic adult patients with celiac disease. Am J Gastroenterol 1994;89(12):2130-4.
. Approach to diagnosing celiac disease in patients with low bone mineral density or fragility fractures. Multi-disciplinary task force report. Can Fam Physician 2013;59:1055-61. (Eng), e441–8 (Fr).
. Significant bone microarchitecture impairment in premenopausal women with active celiac disease. Bone 2015;76:149-57. Epub 2015 Mar 14.
. Abnormal skeletal strength and microarchitecture in women with celiac disease. J Clin Endocrinol Metab 2015;100(6):2347-53. Epub 2015 Apr 13.
. Systematic review and meta-analysis of observational studies on the prevalence of fractures in coeliac disease. Dig Liver Dis 2008;40(1):46-53. Epub 2007 Nov 19.
. Celiac disease and bone fractures: a systematic review and meta-analysis. J Clin Endocrinol Metab 2015;100(1):25-34.
. Stratification of bone fracture risk in patients with celiac disease. Clin Gastroenterol Hepatol 2004;2(2):127-34.
. Risk of fracture in celiac disease: gender, dietary compliance, or both? World J Gastroenterol 2011;17(25):3035-42.
. Body composition and bone mineral density in untreated and treated patients with celiac disease. Bone 1995;16(2):231-4.
. Analysis of the structure and strength of bones in celiac disease patients. Am J Gastroenterol 2003;98(2):382-90.
. Longitudinal evaluation of bone mineral density and body composition in patients with positive celiac serology. J Clin Densitom 2011;14(4):478-83. Epub 2011 Aug 17.
. Evaluation and management of skeletal health in celiac disease: position statement. Can J Gastroenterol 2012;26(11):819-29. Erratum in: Can J Gastroenterol Hepatol 2017;2017:1323607. Epub 2017 Jul 2.
. Reversal of low bone density with a gluten-free diet in children and adolescents with celiac disease. Am J Clin Nutr 1998;67(3):477-81.
. Bone mineralization and body composition in young patients with celiac disease. Am J Gastroenterol 1997;92(8):1331-4.
. Bone mineral density in children with untreated and treated celiac disease. J Pediatr Gastroenterol Nutr 2003;37(4):434-6.
. Coeliac disease and the risk of fractures - a general population-based cohort study. Aliment Pharmacol Ther 2007;25(3):273-85.
. Guidelines for osteoporosis in coeliac disease and inflammatory bowel disease. Gut 2000;46(Suppl 1):i1-8.
. Vitamin D and calcium: updated dietary reference intakes. Ottawa, ON: Government of Canada; 2012. Available from: www.canada.ca/en/health-canada/services/food-nutrition/healthy-eating/vitamins-minerals/vitamin-calcium-updated-dietary-reference-intakes-nutrition.html. Accessed 2018 Apr 24.
. USDA Food Composition Databases. Beltsville, MD: United States Department of Agriculture; 2018. Available from: https://ndb.nal.usda.gov/ndb/. Accessed 2018 Apr 24.
. Systematic review: adherence to a gluten-free diet in adult patients with coeliac disease. Aliment Pharmacol Ther 2009;30(4):315-30. Epub 2009 May 26.
. The Saskatchewan Pediatric Bone Mineral Accrual Study: bone mineral acquisition during the growing years. Int J Sports Med 1997;18(Suppl 3):S191-4.
. Bone mineral density and importance of strict gluten-free diet in children and adolescents with celiac disease. Bone 2010;47(3):598-603. Epub 2010 Jun 19.
. Use of dual energy x-ray absorptiometry in pediatric patients. Bone 2017;104:84-90. Epub 2016 Dec 15.
. Evaluation, treatment, and prevention of vitamin D deficiency: an Endocrine Society clinical practice guideline. J Clin Endocrinol Metab 2011;96(7):1911-30. Epub 2011 Jun 6. Erratum in: J Clin Endocrinol Metab 2011;96(12):3908.
. 2010 Clinical practice guidelines for the diagnosis and management of osteoporosis in Canada: summary. CMAJ 2010;182(17):1864-73. Epub 2010 Oct 12.
. Food sources of calcium. Toronto, ON: Dietitians of Canada; 2016. Available from: www.dietitians.ca/Your-Health/Nutrition-A-Z/Calcium/Food-Sources-of-Calcium.aspx. Accessed 2016 May 8.
. Nutrition. Health eating for healthy bones. Toronto, ON: Osteoporosis Canada; 2012. Available from: www.osteoporosis.ca/wp-content/uploads/OC_Nutrition_October_2012.pdf. Accessed 2018 Apr 23.